Russia may reveal soon the names of cosmonauts assigned to the first space mission of the country’s next-generation spacecraft known as Federation. According to the spacecraft’s manufacturer RKK Energia, the pioneering crew may be selected in the first half of 2018. "The first crew for the Federation spaceship may be chosen next year. It would be appropriate to combine the experimental development phase for the unit [the Federation spacecraft] with the initial stage of the crew’s training. For this purpose, the first flight squads for the crew transfer vehicle should be assigned no later than the middle of next year,” said Alexander Kaleri, Head of the Flight Service of RKK Energia. Although the first manned orbital flight of the Federation spacecraft is scheduled for 2023, the lengthy process of cosmonaut training could last more than three years in order to fully prepare them for the mission. Yury Malenchenko, Deputy Head of Gagarin Research and Test Cosmonaut Training Center, recently disclosed that it would take at least one year to train the first crew for testing the Federation spacecraft and even two years to get the cosmonauts prepared for a mission to the International Space Station (ISS). RKK Energia plans to complete the construction of Federation by 2021. First unmanned flight of the spacecraft should take place in 2022, followed by a manned flight to Earth’s orbit in 2023. If everything goes according to the plan, one year later Roscosmos will send the first crew to ISS aboard Federation. Moreover, the Russian space agency eyes even crewed missions to the lunar orbit as soon as 2025. 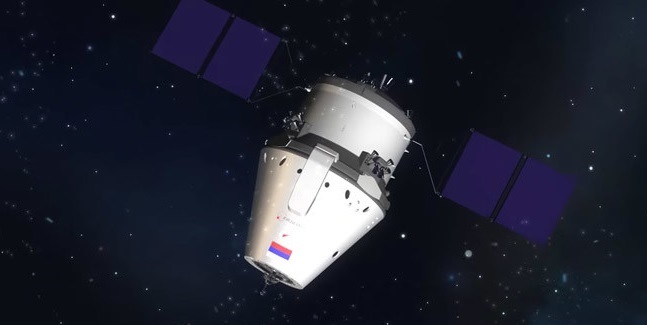 Russia considers Federation as its next-generation reusable spacecraft that the nation hopes will replace the country’s flagship Soyuz vessel. It will measure some 20 feet (6.1 meters) in length and have a mass of approximately 14.4 metric tons. The spacecraft will be capable of delivering people (up to four cosmonauts) and cargo to the Moon as well as to space stations positioned in a low-Earth orbit. It will be also able to operate autonomously for up to 30 days, with the possibility of staying attached to the ISS for up to one year. Initially, Roscosmos planned to use the modified Angara-A5P heavy rocket as a launch vehicle for the Federation spacecraft, however the decision was changed in favor of a future Soyuz 5 booster. The two-stage Soyuz 5 rocket will be around 160 feet (50 meters) tall and its heaviest variant should be capable of delivering up to 25 metric tons to a low-Earth orbit (LEO). First flight of this launcher is expected to take place in 2022.